Although most people imagine the tradition rough coated, black and white dog when considering the Border Collie, the breed does, in fact, come in a variety of coat colors and coat textures. From a genetic perspective, Border Collies can have either smooth coats or rough coats. The smooth coat is dominant over rough, so once a rough is bred to a rough there is no chance for a smooth coated puppy. That is why there are so many more rough coated dogs in the breed. Breeding for the double recessive results in 100% rough coated offspring. Smooth coated dogs may carry the recessive gene for rough coats. So, when bred to a rough coated dogs, a smooth coat that carries the rough gene will produce approximately 50% smooths and 50% roughs. Both coat types also come in a variety of textures and lengths. The rough variety can have a dense, wooly undercoat along with very long guard hairs. These dogs tend to exhibit qualities of their Nordic ancestry. Some of their coats are so thick that it makes grooming a serious challenge. When the texture isn't hard enough, the coat will mat around the ears, under the armpits and under the tail if regular grooming is not provided. On the other hand, some rough coated dogs have a more slick appearance, with limited fringing, although all rough coated dogs will have some trimming around the ears, legs and tail. Rough coated Border Collies can come in just about any length, thickness and texture in between the two extremes. The smooth coated variety, too, can have variation. Some dogs sport a thick undercoat, others have much less. Some have longer guard hairs that may even have a bit of wave. Others have short, straight guard hairs. But, there is an obvious difference between a rough coated dog and a smooth coated dog. None of the smooth coats have the thin coat of, say, a Doberman Pincher or Boxer, however. The breed has been designed to be able to weather any condition in which the job must be performed, and a healthy coat is essential, regardless of its length. Typically, the coat type can be distinguished in puppies from about 5 weeks onwards. Needless to say, the smooth coated dogs are far easier to care for. Their coats do not pick up water or dirt to the same degree as the rough coated dogs which means they track less filth into the house. The smooth coats will dry more quickly after a bath, swimming or working in the rain. Smooth coats do not carry in clumps of mud or balls of snow on their underbellies. Their coats will never mat and never requires excessive grooming. A once-over with a simple brush on occasion keeps their coats in great condition. The smooth coated dogs do not pick up burrs or other debris, either. For these reasons, they are very popular in the southern states, where cattle ranches do not have time or the inclination to maintain a fluffy coated canine. It should be noted that, regardless of the coat on the outside, they are all Border Collies on the inside. There is but one difference between rough and smooth coated dogs, and that is the length (and therefore the ease of managing) of the coat. Many great Border Collies have been of the smooth variety. If one attends a Border Collie herding trial, it will be easy to encounter many smooth coated dogs. The herding folks do not discriminate based on coat type – and many handlers prefer these easy maintenance dogs. But, for some reason, they are not as common in dog sports like Obedience and Agility, which are more likely to be viewed by the average pet-owning spectator. I speculate that is because, at one time, competing in any AKC performance event required acquiring an Indefinite Listing Privilege for the dog. That meant sending photographs of the dog along with the paperwork. It was then up to the AKC to determine whether they would grant an ILP to allow the dog to compete. Folks who may have been concerned that the AKC would not recognize a smooth coat as a pure bred Border Collie refrained from purchasing smooth coated puppies. Years ago, I was given that exact advice. 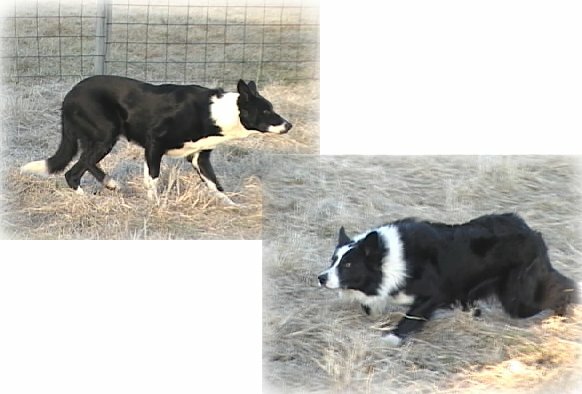 So, the “typical” appearance of a Border Collie in AKC performance events became the more traditional look; black and white, rough coat with typical markings. Temperament is so important in the selection of a Border Collie that is destined to be a companion animal. Working ability is far more important than appearance if the dog will become a performance partner. Structural soundness is critical for a dog’s long term health and ability to carry out a job. 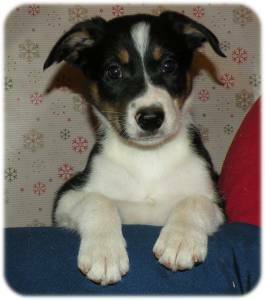 Coat length, color and markings are far less important than any of these other criteria when choosing a Border Collie puppy. We often get requests for puppies with a very specific appearance. One person wrote asking for “a black and white puppy with one blue eye, preferably the left eye, with prick ears and a split face with the white side on the right side”. We also get requests for a specific ear set. Due to the development of a dog’s ear cartilage, ear set won’t be known on a specific puppy until after four to five months of age, well after it has gone to its new home. To us, these sorts or requests suggest that the buyer isn’t at all interested in purchasing a well-bred, properly socialized puppy with a great temperament. Instead, they perceive the dog as its coat color – which is very far down on our list with respect to what kind of companion and working partner the puppy will grow up to become. We are dedicated to placing the right puppy into each home – hoping to match the puppy’s energy level and personality with the human’s disposition and lifestyle. For us, temperament, structure, genetic health, bidability, and the very important herding work ethic are more essential than coat color or type to make a good match. We hope that prospective puppy buyers will consider these critical criteria first, before coat color and / or coat length. 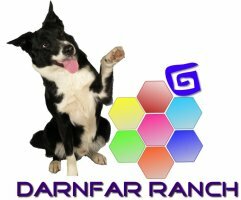 At DarnFar Ranch, some of our best dogs are smooth coated Border Collies. Therefore some of our litters may have smooth coated puppies. If either the mother or the father is smooth, there is a 50% chance for smooth coated puppies. We encourage prospective puppy buyers to remain open to the idea of owning a smooth coated puppy in order to offer them the greatest selection from the puppies that are available in any one litter.